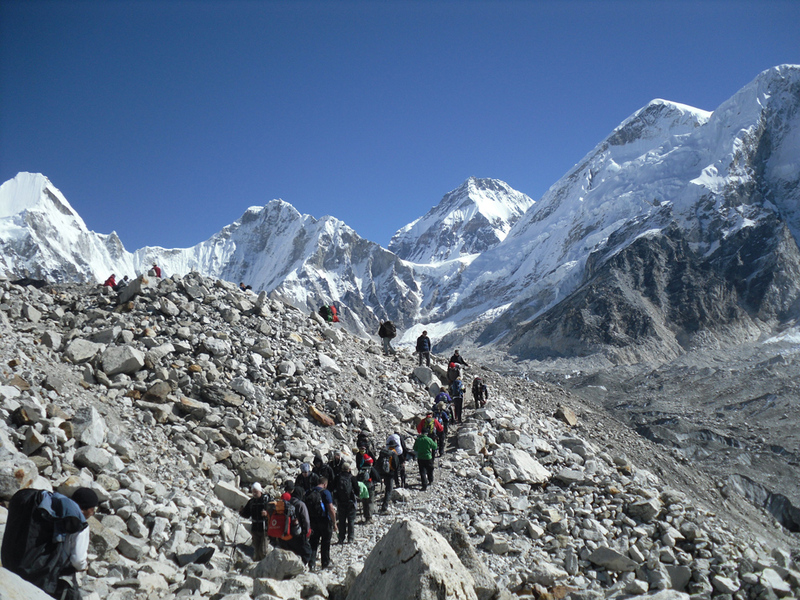 Everest region treks takes you to the foot of the world’s highest mountain traveling through villages, rivers and forests of rhododendron and pine right up to the snowline. These treks afford the closest and most spectral views of the views of the Himalaya including Mt. Everest and you will meet mostly Sherpa and Tibetan people. 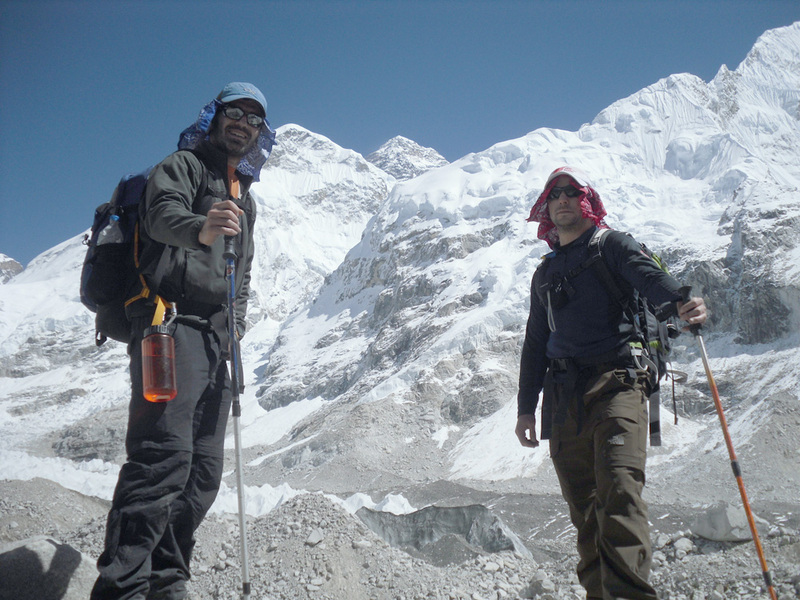 Everest trekking offers you great opportunity to have unique experience. The Everest area is situated in eastern Nepal, protected by the Sagarmatha National Park. The park is largely composed of the rugged terrain and gorges of the high Himalayas. Altitude ranges from 2845 meters above sea level (9,330ft) to the top of the world, Mt. Everest at 8848 meters (29,028ft). Solukhumbu, the heartland of the Everest Region and an integral part of the Himalayan mystique, thus provides a welcome destination for these adventurers. We are committed to providing the best services which will give you a once in a life time journey and share with you interesting facts not only about the Himalayas, but about the Nepali culture, history and religion. Our large number of clients is forever expanding as these adventurers return home with exciting tales of exploration in and around the Himalayas. There are many Itineraries of these treks. You can design the itinerary by yourself. Early morning fly to Lukla (2800m). This flight provides a magnificent entree to the trek region. Upon arrival set up your baggage’s and start your first day trek. It is an easy walk through several villages to Phakding. you follow the Dudh Kosi for about 2 hour and then climb slowly up a steep trail to Namche. As you climb, you enjoy our first views of Everest (8848m), Nuptse (7879m) and Lhotse (8383m).Overnight at Namche. Acclimatization day at Namche Bazar. You enjoy a rest day here to allow for maximum acclimatization on your way to Everest Base Camp. A pleasant day can be spent exploring the village or Shyangboche airtrip, talking to the Sherpas and simply enjoying and marveling at the incredible scenery. Trek along a very pleasant trail under the soaring peak to Thamserku and steadily descending to the Imja River where there are a series of water driven prayer wheels. You climb steadily for about 2 hours to Thyangboche Monastery (3875m) and the views from here are magnificent. The Monastery is literally surrounded by mountains. Yaks graze on the small meadow and the monks drone through their prayers. Yes, this is one of the most beautiful spots in the world. Trek up to the Imja river valley to Pangboche (3900m) where you stop for lunch and visit the Monastery. In the afternoon continue your trek to the summer village of Dingboche(4360m). The scenery all day is superb. another rest and acclimatization day at DINGBOCHE. This rest and acclimatization day should give you an excellent chance of ascending Kalapattar, the Base Camp of the Everest. From Dingboche there are a number of interesting excursions. You can walk to Chukkung (4700m), to the glaciers flowing off Nuptse and Lhotse and return Dingboche for overnight stay. Trek further up a small ridge and then contour around the base of the Khumbu glacier and have a light lunch at Dhugla(4600m). From here you trek a short steep climb to the terminal moraine of the glacier from where the views are stunning. Overnight stay at Laubuche (4930m). Today, you walk to Everest base camp, The actual distance is not so far but you take it very slowly to compensate for the altitude stopping at Gorakhshep for a light lunch and continue trek to everest base camp 5330m following nice and ice-sizzle ring trail. You then take the same way back to Gorakshep overnight. You retrace our steps along the glacier to Pheriche (4260m) and stop for lunch. In the afternoon, take the lower trail to Pangboche and Thyangboche. Descending to Imja River we climb to Khumjung for lunch. Excellent views all the day and overnight at Khumjung (3779m). Descending, pass through Namche Bazaar passing under the towering Kongde ridge (6186m) and follow the Dudh Koshi to Phakding. Trek back to Lukla and overnight. After early breakfast at lodge fly back to Kathmandu. Day 01: Fly to Lukla 2,800 m and trek to Phakding (2800 m). 3/4 hrs. Day 02: From Phakding trek to Namche Bazaar (3,300 m). Day 03: Acclimatization day/ side walk. Day 04: Trek to Khumjung 3790 m. This is very short walk which will be around 2/3 hrs but after this we will be going up to 4000 m so it’s good to walk slow. Day 05: Today walk is bit difficult as we start moving to higher altitude to Dole 4040 m. The trail goes through the settlements of Tongba (3950m) and Gyele. The views of Khumbila and Tawachee 6542 m is tremendous. Day 06: From here trek to Machherma (4410 m).This is a walk of about 5 hrs and the trail continues climb higher along the side of the valley, high above the river, crossing sandy spurs. This is the credible yeti incident ever reported in Khumbu, so be watchful as you visit this region. Day 07: Beyond Machhermo the trail climbs a ridge for an excellent view both down the valley to Kantega and up towards Cho Oyu (8153 m). The trail now becomes almost level as it follows the valley past a second lake, known as Longponga, at 4690 m. And finally up a boulder-strewn path to Gokyo at 4750 m.
Day 10: From here trek to Thangank 4950m, around 6 hrs. Walk. Day 11: Today is a long day walk crossing Cho La Pass (5420 m) to Dzongla, around 7/8 Hrs. Day 12: Trek to Lobuje which takes around 5 hrs. Lobuje is a summer village. The sunset on Nuptse, seen from Lobuje, is a memorable sight. Day 13: Today we trek to Everest Base Camp via Gorak Shep 5160 m. After touching famous Everest base camp trek back to GorakShep. Gorakshep has a small lake that is usually frozen and several monuments to climbers who have died during various Everest Expeditions. Day 14: Early morning hiking Kala Pattar 5545 m from where you can see the entire Everest retreat back to Lobuje. Day 15: From Lobuje walk down to Dingboche 4410 m, you can have good view of Island Peak and Makalu. Day 16: Spend this day in Dingboche walking up to Island Peak base camp and return. Day 17: From Dingboche walk down to Tengpoche. Tengboche is the largest and most active monastery in Khumbu. Day 18: From here we walk down to Namche Bazaar. Day 19: Continue your walk down to Lukla. Day 20: Fly to Kathmandu. Day 01: After your breakfast transfer to the domestic airport, and fly to Lukla (2800m) about 30 minutes with enjoying whole mountain views on north side Annapurna to Everest so that better to choose the left side seat in the plane and meet your trekking crew porters and other staffs who will be waiting with all preparations and about 30 minutes break in the camp site, have a cup of tea, coffee and trek starts with your whole crew and guide to Phakding (2640m) Overnight. Day 02: Trek to Namche Bazaar (3446m). Overnight in nice campsite with Mountain View. This day the trial crosses and re-crosses the Dudhkoshi through the villages of Benkyar, monjo, and Jorshalle then climbs steeply 600m.To the market town of Namche Enjoy market there. Day 03: Rest day in Namche Bazaar for Acclimatization. This day rest for acclimatize and sightseeing around there. First sight seeing Namche bazaar and walk up hill to Sagarmatha national park museum on the hill, inside the house and outside this is one of the viewing point for Khumbu valley and Mt.Everest, Lohtse, Nuptse, Thamsherku, Kusumkhang, Khangteka, Amadablem, Island peak, Touche, Cholache and backside Kongde RI, Tenggiritau, Nup lho shar, pachermo, Tengi Ragitau, Langmocheri, seeing very nice panoramic view and Sagarmatha national park museum and back to campsite. Day 04: Trek to Thame (3820m). 5 and ½ hours walk. Day 05: Trek to Lungdeng (4500m). About 6 hours walk. Day 06: Trek to Yak kharka camp below the Renjo La about 4950m. 4 hours walk. Day 07: Trek over the Renjo pass (5340m) and Gokyo (4790m). About 7 hours walk with the pass. Day 08: Explore Gokyo RI -three hours to climb the summit for rewarding views, Makalu, chhoyou, MT. Everest, Bhorunche, and many others all round mountains. And back to Gokyo overnight here. Day 06: Trek to Lungdeng (4500m). About2/3 hours walk. Day 07: Trek to Yak kharka camp below the Renjo La about 4950m. 4 hours walk. Day 08: Trek over the Renjo pass (5340m) and Gokyo (4790m). About 7 hours walk with the pass. Day 09: Explore Gokyo RI -three hours to climb the summit for rewarding views, Makalu, chhoyou, MT. Everest, Bhorunche, and many others all round mountains. And back to Gokyo overnight here. Day 11: From here trek to Thangank 4950m, around 6 hrs. Walk. Day 12: Today is a long day walk crossing Cho La Pass (5420 m) to Dzongla, around 7/8 Hrs. Day 13: Trek to Lobuje which takes around 5 hrs. Lobuje is a summer village. The sunset on Nuptse, seen from Lobuje, is a memorable sight. Day 14: Today we trek to Everest Base Camp via Gorak Shep 5160 m. After touching famous Everest base camp trek back to GorakShep. Gorakshep has a small lake that is usually frozen and several monuments to climbers who have died during various Everest Expeditions. Day 15: Early morning hiking Kala Pattar 5545 m from where you can see the entire Everest retreat back to Lobuje. Day 16: Cross Kongma la Pass 5535 mt to Chukhung 4730mt. From Kathmandu we drive to Jiri and during two days we follow the Jiri - Lukla old route before heading to a completely new route through forested ridges and sparsely inhabited area. From day six, we trek through high pastures, pine and rhododendron forests without permanent settlement. Walking upstream the Beni Khola we reach Dudh Kunda and keep one day for exploring around. Rather than retracing our footsteps in return, we descend towards Khumbu region for ending in Lukla. Next day we fly back to Kathmandu. Age: Age is an attitude not a problem, but we do require that group members be at least 18 years old.